RIVERWOODS, Ill.--(BUSINESS WIRE)-- Twenty-five percent of consumers plan to spend more this holiday season than they did last year, according to Discover’s annual holiday shopping survey. Younger generations are leading the charge, as 35 percent of Millennials and 33 percent of Generation Z report an expected bump in spending, compared to 26 percent of Generation X and 16 percent of Baby Boomers. The reasons consumers expect to spend more vary between younger and older generations. Gen Z (51 percent) and Millennials (40 percent) say higher wages will fuel increased spending, whereas Gen X (38 percent) and Baby Boomers (36 percent) will boost spending to accommodate more people on their shopping list. The number of those who expect to use credit cards to pay for most of their holiday gifts jumped to 38 percent this year, up from 32 percent in 2017. Less than a quarter, 24 percent, plan to use debit cards to pay for most of their gifts, and 20 percent will primarily use cash. Among those who favor credit cards when making holiday purchases, 54 percent say earning rewards is the driving factor, up from 42 percent last year. Now through December, Discover cardmembers can earn 5% Cashback Bonus at Amazon.com and wholesale clubs on up to $1,500 in purchases after activation. Millennials slightly outpace Gen Z when it comes to embracing emerging technologies like wearables and voice-activated devices when holiday shopping. Thirty-six percent of Millennials and 35 percent of Gen Z plan to use a wearable or Internet of Things (IoT) device—for example, a payment-enabled watch or appliance—to make holiday purchases, compared to 24 percent of Gen X and 8 percent of Baby Boomers. Likewise, 29 percent of Millennials and 27 percent of Gen Z plan to use a voice-activated smart speaker to aid in their holiday shopping, compared to 23 percent of Gen X and 8 percent of Baby Boomers. More than half of respondents, 55 percent, say they are very or moderately concerned about identity theft or fraud during the holidays, down from 62 percent last year. Concern cuts across all generations, but levels are higher among Baby Boomers and Gen X, with 60 and 56 percent, respectively, saying they are very or moderately concerned, followed by 49 percent of Gen Z and 48 percent of Millennials. The vast majority of survey respondents, 90 percent, say they take some measure to protect themselves from identity theft or fraud, including 62 percent who say they monitor their financial statements, 41 percent who monitor their credit reports and 39 percent who use a credit card with built-in security features. 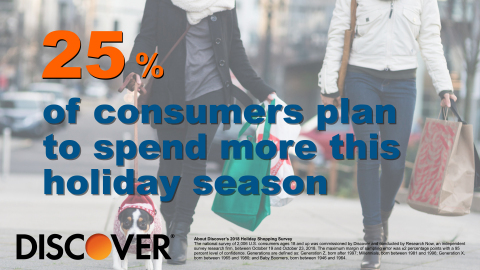 “As consumers embrace new digital technologies while holiday shopping, such as smart speakers and wearable devices, Discover aims to provide peace of mind to its cardmembers by offering a number of free security features on all of our cards, like monitoring every Discover card purchase every day, and offering Social Security number and new account alerts1 that cardmembers can sign up for,” adds Vasudevan. The national survey of 2,006 U.S. consumers ages 18 and up was commissioned by Discover and conducted by Research Now, an independent survey research firm, between October 19 and October 23, 2018. The maximum margin of sampling error was ±2 percentage points with a 95 percent level of confidence. Generations are defined as: Generation Z, born after 1997; Millennials, born between 1981 and 1996; Generation X, born between 1965 and 1980; and Baby Boomers, born between 1946 and 1964. 1 Discover® Identity Alerts currently include the following services: (a) daily monitoring of your Experian® credit report and an alert when a new account is listed on your report; (b) daily monitoring of thousands of risky websites known for revealing personal information and an alert if your Social Security Number on is found on such a website. The Primary cardmember must agree online to receive identity alerts. To see a list of Frequently Asked Questions, visit discover.com/freealerts.